CTA and Globe Sherpa showed off one potential app design. The forthcoming smartphone ticket app for Metra will also make it possible for Chicago Transit Authority and Pace customers to manage their Ventra transit accounts on their phones, the CTA announced last week. Even though the three agencies will spend $2.5 million on the app (plus nearly $16,000 in monthly fees), the Ventra app won’t at first offer customers many more functions than the existing Ventra website. CTA communications manager Tony Coppoletta pointed out to Streetsblog that the 80 percent of CTA customers who have smartphones could use the app to skip the lines at station vending machines or at Ventra retailers, and have easier on-the-go access to their Ventra accounts. Bus passengers, who currently have to go out of their way to reload their Ventra accounts, may find the app particularly useful. As we’ve reported before, the app will also help occasional Metra riders by finally making it possible to instantly purchase Metra tickets from anywhere. For example, an individual who loads $130 every month in pre-tax transit benefits into into a Ventra account could purchase a $100 monthly CTA/Pace pass, and still have $30 each month to spend on Metra tickets. Yet many transit riders won’t benefit from the app. The 20 percent of CTA riders who don’t have smartphones, and others who don’t use bank cards, add up to hundreds of thousands who won’t be able to use the app. Many more CTA riders automatically deposit funds into their Ventra accounts, using Ventra’s auto-load function or pre-tax transit benefits. Similarly, any Metra riders who don’t have smartphones will still have to buy their tickets by mail or in person. Two more crucial technologies that would further simplify transit payments are still set for the indefinite future. First, 1.5 million Ventra customers still won’t be able to tap their cards to pay aboard Metra, as they already do aboard CTA and Pace buses. Metra says that their contract with Cubic Transportation Systems, Ventra’s creator, allows them to test a device that can read Ventra cards on board trains – but Metra hasn’t decided whether to bother with the test. Also left out from Ventra so far are the new “contactless” payments that other companies are rapidly latching on to. RFID-equipped bank cards (issued under brand names like PayWave, PayPass, or ExpressPay) and now NFC-equipped smartphones (running apps like Softcard, Apple Pay, or Google Wallet) can currently pay single fares and load passes at stations and retail shops to board CTA and Pace. Ventra has long promised that anyone using such a bank card or smartphone would eventually be allowed to set up a Ventra account (or link to an existing account), which would allow customers to use transfers, buy passes, and receive transit benefits on their existing RFID bank card or NFC smartphone — and making the plastic Ventra card obsolete. An NFC-equipped smartphone with the Ventra app could then be used to pay fares aboard CTA, Pace and Metra, at long last creating a “universal fare card” valid across the region. The Ventra app, plus “third party registration,” could shorten the queues at O’Hare airport’s Ventra vending machines by allowing these travelers to use their smartphones as transit passes. CTA points out that this capability would be especially useful for visitors. In the future, a visitor arriving at Union Station or O’Hare airport could use the Ventra app to instantly buy a one- or three-day pass while walking to the CTA station, just tap their phone to board buses and trains, and skip the $5 Ventra card purchase entirely. The same visitor could also, of course, use the Ventra app to buy Metra tickets as well. This “third-party registration” hasn’t happened yet due to a programming snafu. The new contactless chips generate fresh card numbers each time they’re used — a security feature that complicates Ventra’s ability to identify the chip. CTA is testing a solution, but can’t say when it will launch. CTA and Cubic have hired Globe Sherpa, which built an app serving 140,000 customers a day on TriMet in Portland, to develop the Ventra app. The CTA told Streetsblog that the three agencies are deeply involved in the app’s development and will test the app with at least 100 riders. It’s sad that I am excited that I will be able to buy a Metra ticket with transit account money. Seems like it would be easier to tap a Ventra card. And let’s not forget about those 20% of Metra riders who don’t apparently have a smartphone. They are still screwed! A GOOD START — The next step is to find away to coordinate fares so you get a discount on rides using multiple Agencies — instead of just being able to pay a separate full fare to each Agency, using the same fare instrument. I installed SoftCard on my Android and was severely underwhelmed. It supports only a handful cards natively, so most people will end up using the Amex Serve card as a pre-paid debit card, with the funds coming from your credit card. I haven’t tried setting up Amex Serve with my RTA Commuter Benefit credit card. Has anyone done that successfully? That is the only way I see a compelling use case. I installed it and it works for me since I already have some of the supported cards. Still, its mostly gimmicky since I’m not going to leave the house without my wallet and the physical cards until 100% of retailers can read the phone. Every time I’ve used it so far I’ve pulled out my wallet, then put it back in my pocket and grabbed my phone. I’m sure the shiny-new-toy phase will wear off quickly. Being able to add my Ventra card or attach a Ventra account my credit card would actually be useful as I could then not carry the separate Ventra card. Note that Amex Serve comes with a $1/mo fee so you have to get at least $1/mo in convenience out of it for it to be worth it. 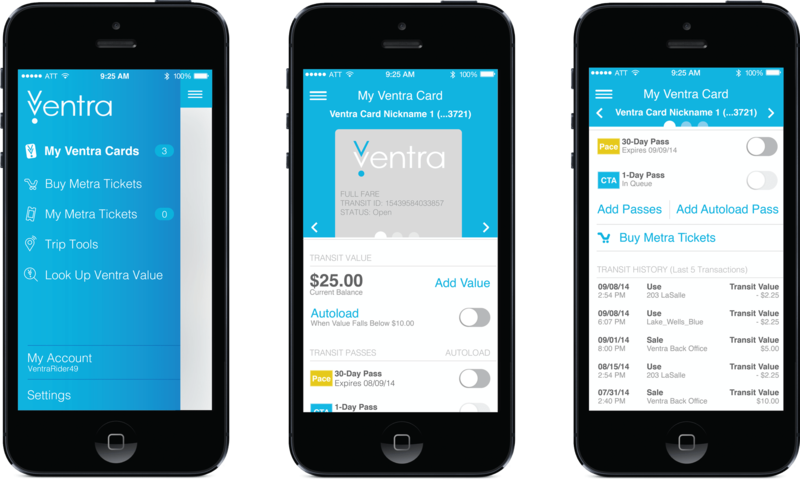 The Ventra website fits nicely on screen and I can do all the functions I need, including adding value or a pass to my ventra card on the go. It seems silly to waste all that money on an app when the website designed for mobile screens works just fine. Thanks for covering this. I work in transit on fare payment projects and I’ve been following the Ventra debut closely. These entities are trying to accomplish several goals through these new offerings. Ultimately, they want to make paying your fare as easy and fast as possible. I’m actually impressed that the percentage of smartphone ownership is 80% in your area. It’s only about 57% here amongst LA Metro Bus’s ridership. (Over 73% own a cell phone, and 3/4 of those own a smartphone… works out to the high 50s overall). I think you should be impressed that CTA et al are trying to attach to the gradual movement to mobile wallets. It was slow moving for a long time; Apple Pay could potentially that (my condolences to the BofA customers who were double-charged for their ApplePay transactions). I get it. There will be 20% of the ridership that cannot use mobile ticketing. But it is possible that was the 20% of your ridership that was always going to have to pay in cash because they do not have the wherewithal to keep a smartcard epurse loaded (ie they are low-income, they don’t have formal banking). I don’t know what the cash payment rate is like in your area; if it is anything like mine (45%) you’ll do whatever it takes to convert those who have the financial means to use a form of prepayment. It speeds boarding. Everyone benefits (especially the poor, or your 20% who don’t own smartphones) when the bus can keep moving because boarding times have been slashed. Your bus system is more productive and riders can get to where they want to go more quickly. I used Apple Pay on the CTA at a turnstyle last evening. I thought it would take the $2.25 PayG fare which the CTA site says is the fare for a contactless bank card. It took $5.00. I got my Softcard set up now that they support my brand of credit card. -United miles require a Chase United MileagePlus Visa card which is free the first year, then $95/yr for the cheapest option. If you qualify. CTA is also full fare only, no transfers. – I guess the offers are personalized. Mine runs through the end of the year. – The United card fee is $60 a year. Ive had one for years, since i spend enough to make it worth my while. I have not used it yet, but they make it attractive enough to give it a shot. I guess it will be somewhat less convenient than swiping my NFC-enabled credit card: Take out phone. Turn on NFC radio. Open app. Enter pin. Swipe card. You appear to be right about the Serve being free through Softcard. I believe the plastic card version has the fee. I use Softcard where I can because of the added security, but until it is accepted everywhere I am still going to have to carry a physical card. It’s going to be awhile until that happens, especially with the Retail Merchants Association coming out with their own far less secure version and actively shunning Softcard/Google Wallet/Apple Pay. We’re *at least* 2-3 years out of phone payments being ubiquitous enough for me to stop carrying a wallet. Is the softcard security similar to iPay, where it doesnt send your cc number, but instead a unique transaction id? I agree it might take a while, but with Apple and the RMA entering the market for contactless payments, there seems to be a sense of urgency that didn’t exist before. Yes, I believe all tap-to-pay technologies work this way, which is why they are inherently more secure than magswipe. I don’t know the exact intricacies or differences, though. I looked at the SoftCard site and it amazes me how few places this technology is accepted at. It may be because SoftCard linked itself to Amex, not the most widely accepted card. Well how’s that for timing; Softcard just sent me a $10 gift card. I didn’t even realize I qualified! Yes, one of the sites I googled during our conversation said tap-to-pay technology is accepted at about 220,000 retailers, where magswipe is accepted at over 18 million locations. We’ve got a looooong way to go. Even though I don’t have an iPhone, I’m hoping Apple Pay pushes the issue and accelerates the changeover. You can use Softcard at more places than listed in their app. It should theoretically work anywhere you see a tap-to-pay logo. I’ve used it at CVS (before last weekend), Whole Foods, and the United Center. This, from my perspective, is much more central to fare structure improvement than apps and cards. I’m one of those who doesn’t have a smart phone. I can afford a smart phone; I bought them for my wife and two kids (although, since my wife earns more than I do, I guess I really bought her a phone using her money), but I don’t want one. I particularly don’t want to pay CTA fares using a phone. My ventra card works fine, thank you very much. The new card not only looks great, it does away with the arguably predatory prepaid debit option.